JUST IN TIME FOR EASTER!!! 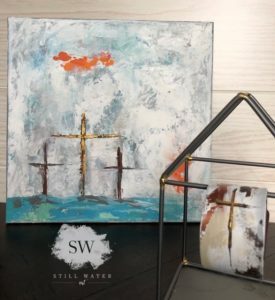 Join Andrea Milsaps with Still Water to paint this beautiful cross seen. The canvas is 12×12 and you will use paint brushes and palette knives for added texture. You can choose your colors to match your decor. 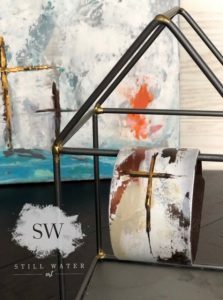 ***One lucky painter will WIN a hand painted Still Water leather cuff!!! The one pictured is the one they’ll win. Get notified about specials, discounts, and other breaking news from Tin Roof Trading Company.